I've watched some difficult Arsenal games before but I don't think I've ever been so relieved to walk out of the Grove after 90 minutes with a victory like the one we achieved last night. We got off to a good start. There can be no denying that. Theo Walcott's strike had us ahead after four minutes. Aaron Ramsey making the goal for the Englishman who fired the ball home from close range. The Gunners were adding the pressure, the fans were behind the team and everything was looking good. we had more chances but then Udinese came back. A Di Natale free kick crashed against the wood work. It was end to end stuff for the remainder of the first half. Our defence held strong but our midfield couldn't get its foot on the ball and our attack wasn't providing Marouane Chamakh with any service what so ever. You could see that in front of goal we weren't at our best. Walcott and Gervinho with the best of them but if truth be told they were easy for the Udinese keeper to save. The Ivorian and the Englishman should really spend more time in training working on their final ball, because up to the point where they have to make the killer pass or take a shot, they let themselves down. Down the middle of our defence we had not given away a lot. Koscielny and Vermaelen making the required tackles which prevented Udinese having eyes on goal. At half time we were forced into making a substitution. Kieran Gibbs going off with a hamstring injury to be replaced by Johan Djourou. Captain Vermaelen went to left back and Djourou took the Belgium internationals place on the left hand side of central defence. It was only after three minutes of coming on that Djourou tweaked his own hamstring, with a last ditch tackle to prevent Di Natale from scoring. And nine minutes into the second period, Carl Jenkinson came on to make his Champions League debut. Just last Christmas he was playing in the Conference for Eastbourne Borough. A steep rise for the teenager. Jenkinson moved to left back and Vermaelen reverted to the position he held prior to half time. Udinese took control of the game. Arsenal's midfield looked anonymous. It was painful. The crowd were restless. We'd hardly seen any attacking threat from the Gunners and now two defenders had to come off because of injury, therefore restricting Wenger's attacking options later in the half. The Gunners tried to take advantage on the break, but final balls were the problem. 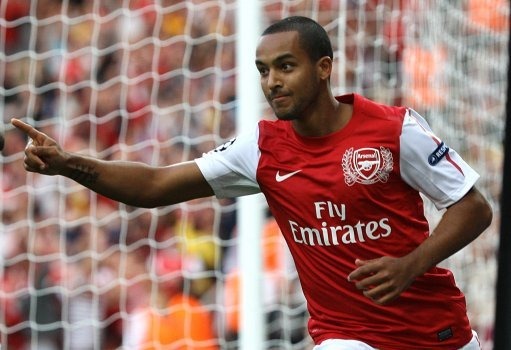 Walcott with a prime miss 20 mintues from time after good work from Ramsey. Arsenal's final change of the match saw another youngster make his European debut with Emmanuel Frimpong replacing Tomas Rosicky. The team couldn't really any younger and I was concerned we were making a mistake by removing the Czech international's experience for Frimpong's youth. More fine work from Szczesny saw him deny Di Natale when the Italian took a free kick which the keeper was equal to 15 minutes from time. And our work on the break saw another chance for Gervinho go begging. Walcott was also wasteful. And then in the final minute of normal time Walcott was denied by a quite brilliant save from Handanovic. He tipped the ball around the post as it looked like it was heading just inside the woodwork to add Arsenal's second of the night. Udinese should have done better when awarded a free kick two minutes into stoppage time but Di Natale wasted the opportunity. It finished 1-0 to Arsenal but not without a cost. It looks like the injuries to Gibbs and Djourou could keep them out of the Gunners weekend fixture with Liverpool. Post match Arsene Wenger didn't host a post match press conference after falling out with UEFA over whether he was allowed to communicate with the Arsenal bench. He was told he could through Boro Primorac. Whilst we must be pleased with a victory considering the circumstances, Wenger will know he has to add to his squad heavily before the window closes. We are already threadbare in midfield and now we have two defenders out added to the injury sustained with the reserves on Monday night. We need investment that is clear for all to see. Happily there were no "spend some money" chants, although I did hear the odd individual shout out that line which then got sung over, which I was personally glad about. We were there to support the team for 90 minutes, not dictate to Arsene Wenger his transfer policy. He know we need to add strength in depth. But I worry that we've just let another player (Carlos Vela) go even though he was on the profirary of the squad. The defence, having kept its second clean sheet in two matches, doesn't worry me as much as our attack. We're missing too many key players and need some quality replacements. With Fabregas gone and Nasri expected to be off before the end of the week - especially after it appeared he was trying to alienate himself further with Gooners after pockets of the media ran what Nasri now says are fake comments on Facebook in several stories, Arsene Wenger must spend the next couple of days using his extensive database of players to decide exactly who would add quality to our team. With Emmanuel Eboue leaving to join Galatasaray, Carlos Vela going on loan to Real Sociedad and PSG interested in signing Nicklas Bendter, our squad is becoming even more paper thin. Just have a look at it on the official site and tell me how we are meant to compete with three of the 30 in limbo over their future (Alminua, Nasri and Bendtner); three out of eight defenders injured; three out of ten midfielders injured, leaving us with a squad of 21 players, some of whom are very very young. One player who he might well go for is Eden Hazard according to L'Equipe. We've been linked with him heavily but Lille are said to be bracing themselves for a bid of £30m. Would they turn that down? It's a lot of money for a 20-year-old. But Wenger has kept his eye on him throughout his development so I wouldn't be at all surprised if we went for him. Another player we're looking at is Yann M'Vila, the Rennes and French international midfielder according to Matt Law of the Daily Express. Finally, congratulations to Robin van Persie who has been appointed Arsenal captain. I don't think Arsene Wenger could have made a better choice. Van Persie is liked by everyone at the club, a role model for the younger players and someone who always gives their all.